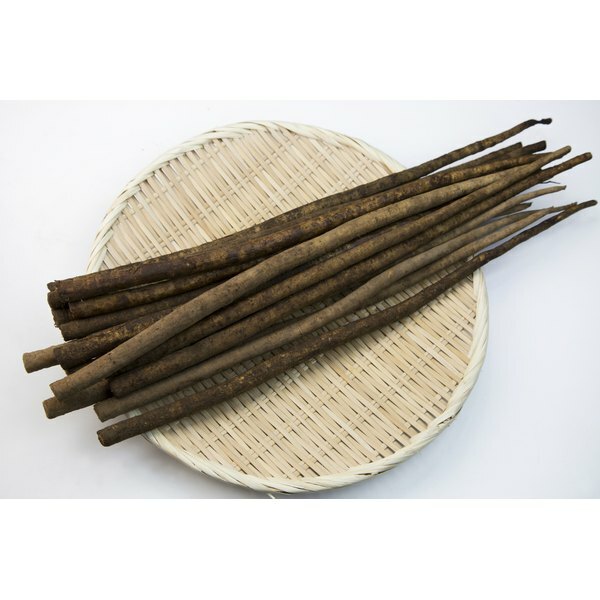 Burdock root is a natural supplement derived from the roots of a weed called Arctium lappa. This supplement may be administered orally to help clear toxins from your bloodstream or topically to treat inflammatory skin conditions such as eczema or psoriasis, the University of Michigan Health System explains. Talk with your doctor about burdock root and its potential side effects before you begin using this type of supplement. Taking burdock root typically does not cause noticeable side effects. If you experience any unusual health issues while receiving treatment with this supplement, consult your physician for further evaluation and care. People who are allergic to certain plants, such as ragweed, daises or chrysanthemums, may also be allergic to burdock root, the University of Maryland Medical Center warns. Improper use of this supplement by hypersensitive people may induce a potentially life-threatening allergic reaction called anaphylaxis. Seek immediate medical attention if you exhibit symptoms of an allergic reaction, such as hives, shortness of breath, difficulty swallowing, facial swelling, weakness or dizziness. If you consume burdock root as a tea tincture, you may be at risk of experiencing side effects of burdock root tea poisoning. This side effect occurs infrequently, but it may cause seizures, flushing, dry mouth, skin rash, poor coordination, drowsiness, restlessness, vision alterations, headache pain, slurred or incoherent speech or fever, Drugs.com warns. Consult your doctor immediately if you develop one or more of these side effects after ingesting burdock root tea.